When the Wisconsin Legislature convenes for 2017, Bereaved Parents of Madison will be visiting our state representatives in the hopes of getting a legislative proposal to a vote. Bereaved Parents of Madison, along with a coalition of groups across the state will propose a bill that will give a state tax credit to families who’ve experienced stillbirth. The proposed legislation is modeled after a law recently enacted in the state of Minnesota, which allows an individual a $2,000 tax credit for each stillborn child. A certificate of birth resulting in a stillbirth, which Wisconsin already issues, is required for the credit. This legislation is another way to have our babies recognized and hopefully ease some of the pain of not being able to claim them as dependents come tax time. On Monday October 9, 2017, we were notified that Bill 138 would have a hearing before the Senate Committee on Revenue, Financial Institutions, and Rural Issues on Wednesday October 11. We put out the call to our parents and they made it happen! The Embraced support group facilitator, a representative from the WI Chapter of Star Legacy Foundation, and seven parents from Bereaved Parents of Madison testified. The parents testified to share their personal experiences with stillbirth and the great financial burdens that came as a result. Each testimony added another layer and connected to the others in some way. We though that each parent did an amazing job before the committee and we are eager to take the next steps! ​Thank you to everyone who has help in some way. Bills officially introduced in the Senate and Assembly! You can follow the links below to keep track of the progression of each bill, and you can sign up for notifications related to the bills. We have a bill... now what? Here are the things we can do now that the bills have been officially introduced in the 2 houses of the legislature. 1. Send a Thank You to Senator Darling and Representative Ballweg for sponsoring the measure and introducing it - handwritten notes would be best! 2. If your legislator is listed as a co-sponsor, thank them for supporting the measure! 3. Contact members of the committees to which the bills were referred (Assembly: Ways and Means Committee; Senate: Revenue, Financial Institutions, and Rural Issues) and urge them to vote favorably on passage out of committee! 4. Get others to contact their legislators and do the same - we want all members of the Senate and Assembly to know this bill exists and we want them to support it! 5. Write letters to the editor explaining the importance of this bill to you and your family and urge readers to contact representatives to pass this bill! We are waiting to hear about a public hearing on these bills. If one is scheduled, we'll ask you to come to Madison and testify in support of the measure. We will get advance notice and will be able to coordinate! I'm also going to be posting template letters we can use to send to legislators. Be on the lookout for those - should be posted tomorrow! Right now, we just want to get as much support in the Legislature as possible and as much publicity on the issue as possible. If you know a reporter, send them a note, link to the bill, and tell them this is a good story! We are excited to announce that the bill garnered 24 co-sponsors!!! Representatives Ballweg, Quinn, Jacque, Billings, Ripp, Kleefisch, Kulp, Thiesfeldt, Loudenbeck, Ed Brooks, Bowen, Neylon, Skowronski, Horlacher, Rohrkaste, Kremer, Tusler, Sinicki, and Felzkowski. The Senate and Assembly versions of the bill will each be referred to committees in their respective houses. Inside the committee, the bills will have public hearings. We will be updated on the dates of these hearings as they get scheduled. During the public hearings, Senator Darling and Representative Ballweg will testify on the bill and answer questions from other legislators on the committee. After the legislators testify, any one from the public can speak on the bill. If your legislators are listed as co-sponsors, please call or email them to thank them for their support. Representative Ballweg and Rebecca Markert were interviewed by WKOW 27 News on March 15, 2017. The story was shared by WQOW 18 in Eau Claire as well. Rep. Ballweg and Sen. Darling are currently seeking co-sponsors for the bill. Please contact your legislators - in the assembly and the senate - and urge them to co-sponsor LRB 2452/1 creating a refundable individual income tax credit for the parent of a stillbirth. The deadline for co-sponsorship is March 17th so we need to call or write NOW. Please feel free to use or adapt as you feel necessary when you are contacting your legislators. Re: Co-sponsorship of LRB 2452/1: creating a refundable individual income tax credit for the parent of a stillbirth. As a parent of a stillborn child and a constituent in your district, I strongly urge you to co-sponsor a new bill proposed by Representative Ballweg and Senator Darling, LRB 2452/1, which creates a refundable individual income tax credit for parents of stillborn children. Bereaved families across Wisconsin are hoping that Wisconsin will become the next state to pass this important legislation. Approximately 300 families in Wisconsin experience the heartbreaking tragedy of a stillbirth each year. Many of these bereaved families incur the same expenses as families of children born alive and healthy, yet the current tax code only allows a deduction to help with the costs of childbirth for babies who live, even if they die shortly after birth. Parents of stillborn children are not eligible for this credit simply because their child did not take his or her first breath. These bereaved families accept the additional burden of many financial costs, including the arrival of the child, funeral expenses, time away from work, and grief counseling. These expenses add up to thousands of dollars. Ballweg’s and Darling’s proposed legislation would correct the inequality and create a $2,000 refundable tax credit for the parents of a stillborn child. This will help hundreds of grieving Wisconsin families absorb costs associated with the death of their babies. Of course, this bill is about more than money. It’s about acknowledging the families who go home from the hospital empty-handed. Five states have already passed laws allowing a tax credit for parents of stillborn children: Minnesota (2016); Missouri (2015); Indiana (2007); Michigan (2006); and Arizona (2004). On behalf of all Wisconsin families of stillborn children, I respectfully urge you to co-sponsor this legislation. If you would like to co-sponsor this legislation, please contact Rachel in Senator Darling’s office at 6-5830 or Bethany in Representative Ballweg’s office at 6-8077. 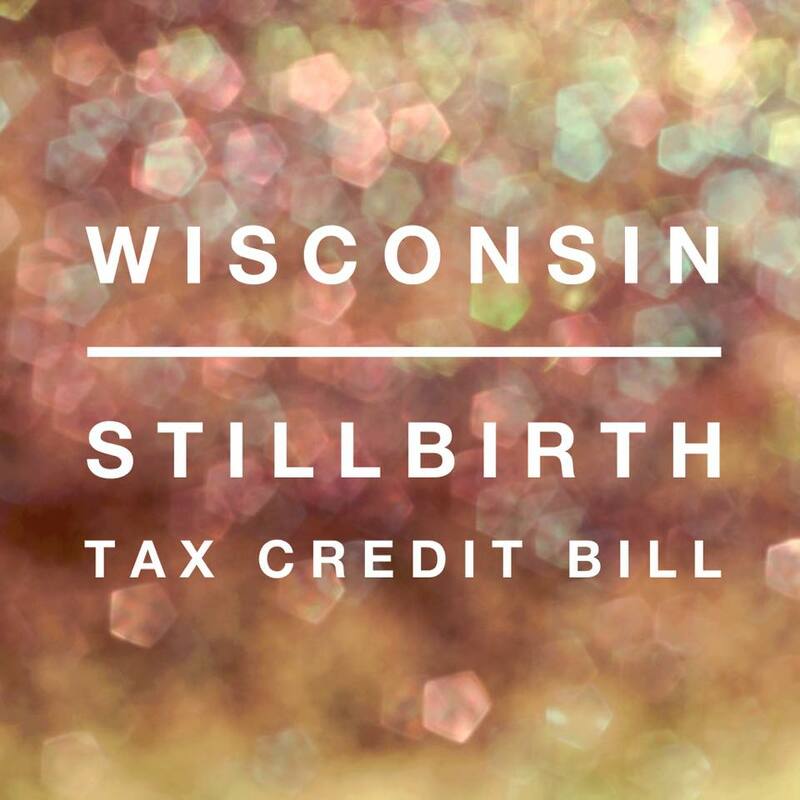 EXCITING NEWS: We have a sponsor for the Stillbirth Tax Credit! Rebecca (BPoM Education and Outreach Chair) and her husband, Michael met with Rep. Joan Ballweg this afternoon and she's going to draft a proposal for consideration this year. We hope that the draft will happen quickly. Once proposed, we'll be able to have you all send your legislators letters and emails asking to co-sponsor the bill. She is also interested in having a public hearing on the measure, and if that happens, we will need you to come to Madison and share your stories with legislators! We also discussed a resolution for Pregnancy and Infant Loss Awareness Month for October. Rep. Ballweg also has a personal interest in this as well because her daughter, Jackie, was born premature and lived a short 12 hours. She's very understanding. ​If you want to know how you can help, please join the advocacy mailing list to be alerted to new developments. Alberta Darling is a sponsor for the Senate!! !